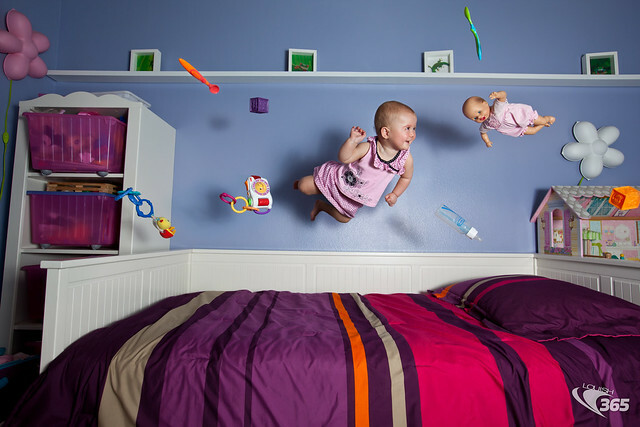 This is Bree's Baby ( www.flickr.com/oshynlover/ ) - We had a lot of fun doing this levitation. No babies were harmed in the making of this photo. Key Light: Canon 580ex II on right with white shoot through umbrella, set to 1/2 power triggered with RadioPopper JrX. Fill Light: Canon 580ex II on right with white shoot through umbrella, set to 1/8 power triggered with RadioPopper JrX.